Charlotte Flair’s music hits, and she makes her way to the ring to boos from the crowd. Replays are shown of Stephanie McMahon suspending Becky Lynch last night on RAW. Lynch attacked her, so McMahon kicked her in the knee. Flair says the only thing more dangerous than ignorance is arrogance. Last night, Becky Lynch’s arrogance got the best of her. She refused medical attention and beat up Stephanie McMahon. It was her rogue behavior that got her suspended. Flair sarcastically hopes that Lynch is better for WrestleMania. Flair starts a mock “Becky” chant. Flair knows someone who is 100% healthy and would love to face Ronda Rousey at WrestleMania. Flair points at the WrestleMania sign. 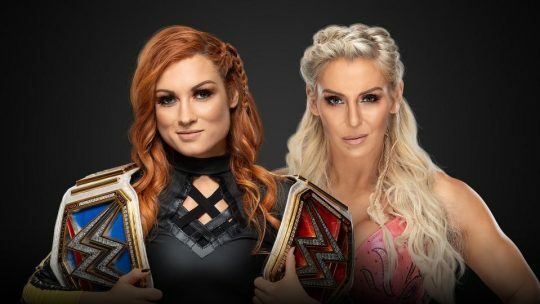 Flair continues to point at the sign until Becky Lynch emerges from under it through the crowd. Lynch marches her way to the ring through the crowd. The crowd loudly cheers her. Flair is angry that not only did Lynch steal her father’s nickname, but she has also now stolen Roman Reigns’ entrance. Lynch gets in the ring, easily bypassing security, and says Flair is out of her damn mind if she thinks she’s stealing her WrestleMania main event. Triple H makes his entrance and tells Lynch that she’s suspended and has to go home. If she goes to a doctor, she can have the suspension lifted. Flair is laughing at Lynch, so Triple H sends her to the back. Triple H has the referees back up so he can confront Lynch. Triple H tells her to see the doctor and get cleared. Lynch says she doesn’t trust any of this in good faith. Triple H says she doesn’t have to trust it. It is what it is. Triple H goes to leave, but Lynch asks how Stephanie McMahon is. Did Triple H make sure she’s medically cleared after Lynch punched her in the face? Triple H angrily looks at her while a loud “Becky” chant fires up. Triple H gets in the ring and says he didn’t see it until now. Triple H bought into the whole “I’m the man” crap like the crowd did, but the truth is Lynch isn’t the man. That’s a lie. Lynch is just a self-destructor afraid of failure. Lynch smiles back at him. Triple H says he can see the look in her eye. Lynch knows he’s right. Triple H says Lynch is looking for a way out of this. That’s why when she got her career pinnacle moment by getting a match against Ronda Rousey at Survivor Series, she recklessly came to RAW and found her way out of it. Lynch then came out and blamed the doctor. Lynch blamed “doctor prison,” but it’s just an excuse. Triple H tells the crowd to shut their mouths. Now Lynch scratched and clawed to an opportunity at WrestleMania against Rousey, but now she’s again looking for a convenient way out. The truth is Lynch is just afraid to go to the doctor and afraid of what the doctor might say. Triple H doesn’t even think she’s injured. Is this just an act to find a way out? Triple H says Lynch is afraid the doctor will say she can go to WrestleMania. Lynch is afraid that Ronda Rousey will expose her as the fraud she is. Lynch continues to smirk. Triple H says Lynch is afraid that she’ll prove to everyone at WrestleMania that Becky Lynch fears Ronda Rousey. Lynch then slaps Triple H in the face and steps up to him. A “Becky” chant picks up as Triple H goes face-to-face with her. Lynch defiantly stares right back at him. A loud chant of “One more time” picks up. Lynch then smiles and backs up before leaving through the crowd. It’ll be Luke Gallows starting against Shinsuke Nakamura. Gallows knocks Rusev down before shoulder blocking Nakamura. Karl Anderson tags in, but Nakamura kicks him in the face. Rusev tags in, and they argue a bit. Anderson rolls Rusev up for a two count. Gallows knocks Nakamura out of the ring, and Rusev dumps Gallows out of the ring. Anderson then knocks Rusev out of the ring before hitting him and Nakamura with a summersault senton. We come back from the break to see Nakamura applying a front facelock to Anderson. Anderson fights out and chops him. Nakamura quickly forearms him down and goes for a kick, but Anderson ducks and delivers an uppercut. Nakamura reverses a whip to the corner. Nakamura then turns him inside out with an inverted exploder. Nakamura sets up for the Kinshasa, but Anderson counters with his spinebuster. Gallows and Rusev are tagged in. Gallows shoulder blocks him, punches him, and hits a kick to the head. Gallows avalanches him and connects with a superkick. Gallows then hits a sit-out bomb on Nakamura. 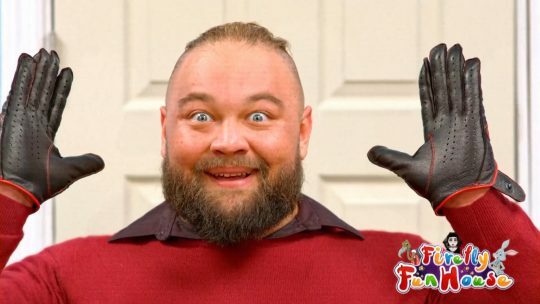 Gallows and Rusev then wipe each other out with a double clothesline. Lana, who is in a walking boot, screams at Nakamura to get up. Anderson tags in. They go for the Magic Killer, but Nakamura breaks it up. Nakamura hits Gallows with the Kinshasa. Anderson hits Nakamura with the Rocket Kick. Anderson then turns into a Machka Kick, and Rusev picks up the win. 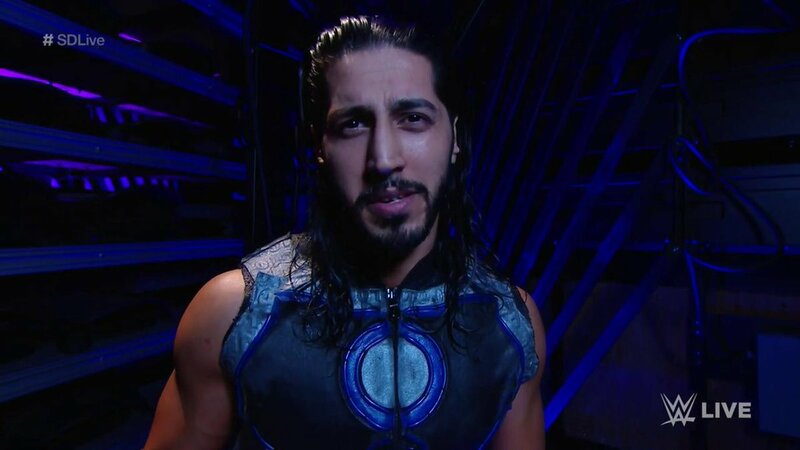 Mustafa Ali is shown backstage. Ali says no one expects a guy like him to survive Randy Orton and the Elimination Chamber. What if they’re wrong? What if the Viper goes to strike, but he misses? What if he survives Elimination Chamber and goes to WrestleMania as the WWE Champion? What if? Paige is backstage and thanks the fans for not forgetting about her. Paige promotes the movie about her life, “Fighting With My Family.” They show the trailer for it. McMiz TV debuts next week with special guest The Usos. The Usos are backstage. Jimmy Uso says they’re taking on Shane McMahon and The Miz for the Tag Team Championships at Elimination Chamber. They talk about how they think they’re the best in the world. It sounds like Miz and McMahon are trying to be them. They’re different. They know how to struggle together, starve, be hot and cool at the same time. Jey Uso says they don’t know, but Miz TV is about to get locked down. Welcome to the Uso Penitentiary! A pre-taped promo has Randy Orton saying he won’t bother to learn his opponent’s name tonight. This guy is just like the others he’s faced: prey. Orton will win the Elimination Chamber. They circle the ring and lock up. Orton powers Ali to the corner and gives a clean break. Ali then chops Orton’s chest. Ali punches back at him until Orton kicks him. Ali comes back with a kick and hits the ropes, but Orton clotheslines him down. Orton stomps away at Ali before hitting a front suplex onto the top rope. Ali falls to the floor, so Orton gives him a back suplex onto the commentary table. Orton gets him back into the ring for a two count. Orton applies a chin lock, but Ali fights up. Orton sends him to the corner and charges, but Ali flips over him. Ali hits the ropes, but Orton grounds him with a powerslam for a near fall. Orton puts Ali on the top rope. Ali fights him off, but Orton crotches him on the top rope. Orton then hits a big top rope superplex for a near fall. We come back from the break to see Orton bounce Ali off the turnbuckle. During the break, Orton gave Ali a guillotine catapult onto the bottom rope. Back to live action, Orton takes Ali down for a two count. Orton then quickly goes to the chin lock. Ali fights up, but Orton clubs the back. Orton sends him into the ropes, but Ali wipes him out with a dropkick. Orton quickly leaves the ring to recover. Ali goes outside to get him, but Orton kicks him before bouncing him off the commentary table. Orton goes for a back suplex onto the table again, but Ali gets out and dropkicks him over the table. Ali then hits a running cross-body block and punches away at Orton. Ali tries to put him in the ring, but Orton reverses it. While Orton gets in the ring, Ali kicks him before superkicking him twice. Orton is down on his knees. Ali charges, but Orton drops him onto the apron. Orton goes for a draping DDT, but Ali gets out and kicks him in the face. Ali then hits a rolling sit-out face-buster, but Orton kicks out. A light “Mustafa” chant picks up. Ali teases a cross-body, and Orton shows his hand by attempting an RKO. Ali then surprises him with a diving tornado DDT for a near fall. Ali sets Orton up and goes to the top rope for the 054. Orton gets up, pulls him off by the legs, and hits an RKO out of mid-air for the win. While Joe goes to leave the ring, WWE Champion Daniel Bryan makes his way to the stage. Samoa Joe smiles and walks right up to Bryan. Rowan then comes out and stands in front of Bryan. Joe then walks around them and goes to the back. Bryan is still sporting a black eye. Bryan then makes his way to the ring with his new eco-friendly WWE Championship. After commercials, backstage, Samoa Joe says tonight was about retaliation, but the end will justify the means when he holds the WWE Championship in the air. WWE Champion Daniel Bryan is in the ring holding up his eco-friendly title alongside Rowan. They announce Bryan as “the favorite son of Washington,” getting him a great reception. A “Daniel Bryan” chant fires up. Bryan says, “Finally I get to talk to people who understand what I’m trying to do here.” The crowd loudly pops for that and starts a “YES” chant. Bryan says the people of the great state of Washington are intelligent people. They’re smart people. They realize that we need change. The crowd emphatically agrees. Unfortunately, as the WWE Champion, he speaks to a global audience. These people that he speaks to don’t understand that their crass behaviors destroy their minds, fatten up their bodies, and kill the very planet we all live on. They fill their emptiness by stuffing their faces with deep fried animal carcasses to get the dopamine rush to get them over the next hump. Bryan says he is fighting an uphill battle. That is why he has created this eco-friendly WWE Championship. It is a symbol for people to rally behind. The old WWE Title was a symbol of excellence, but it was also a symbol of excess. This title is not only a symbol of excellence. This title is a symbol for change. A light “YES” chant picks up. Bryan says there are people that are threatened by that change. Rowan says anyone who has read about the life of Galileo know that great thinkers like him and Bryan are considered dangerous because of their ideas. Their ideas all have good intentions. That’s why people fear them, especially Bryan because he holds the title. As long as Daniel Bryan is WWE Champion, they will try to silence him. The crowd says, “WHAT” during Rowan’s speech, which angers Bryan. Bryan says they try to silence him because he is not their champion. Bryan serves a greater power than corporate greed, money, and power. Bryan is the planet’s champion. The suits back there don’t like that. 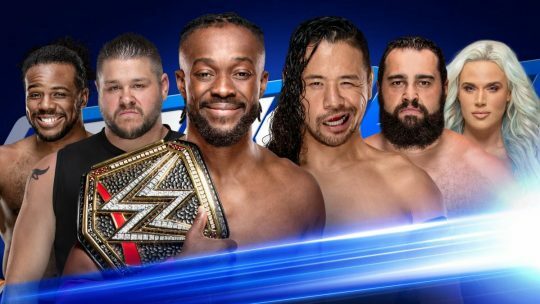 That’s why they put him in a match he shouldn’t be in where he has to defend his title against five other men inside the Elimination Chamber. Bryan has been there before. Bryan knows what it takes. That only serves to reinforce how dangerous and painful this situation is. If you don’t know about it, you can take a look. AJ Styles, Randy Orton, Mustafa Ali, Samoa Joe, and the man that he faces tonight, Jeff Hardy — those are the men who will be locked inside the Elimination Chamber with them. All of them want to take the WWE Championship backwards and put it on a leather strap. They want to take everyone into the past. Bryan can’t have that. The people need him as WWE Champion. The ignorant masses need him as WWE Champion. Most importantly, the planet needs The New Daniel Bryan as the WWE Champion. The crowd cheers him. Bryan and Rowan then leave the ring. 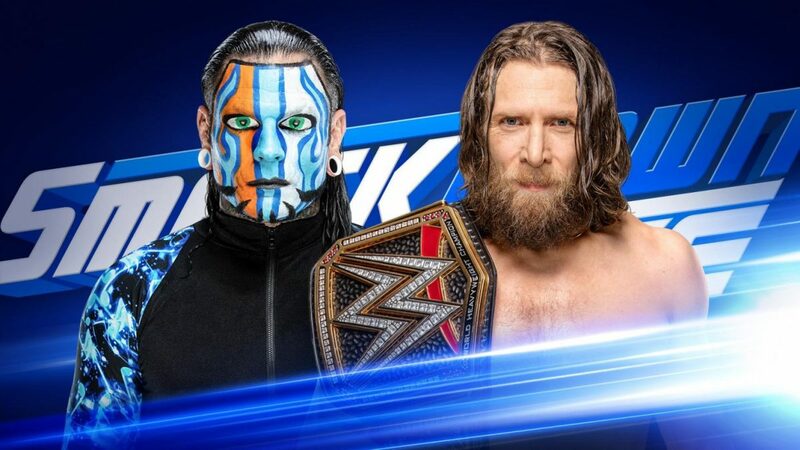 Jeff Hardy is seen watching this backstage. Hardy says as a former champion, this makes him sick. Hardy is part of the WWE Title’s legacy. Hardy says you can’t change the ways of a madman. Instead of telling Bryan to shut up, he’ll go out and make him. AJ Styles then walks up and says Hardy has been here a long time. With Hardy’s recent history, is he really the guy to represent that title? Hardy says with Styles’ recent history, the real AJ Styles can’t beat The New Daniel Bryan. Styles says maybe Hardy missed the bald Sasquatch in the ring. 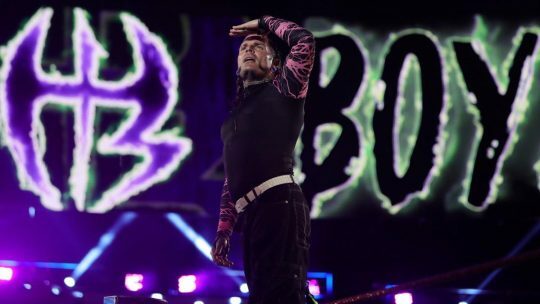 Hardy says if Styles did his job at the Royal Rumble, they wouldn’t be having this conversation. Once he puts Bryan down tonight, they’ll continue this conversation in the Chamber. Carmella makes her entrance, as does Naomi. They make their way to the ring. A pre-taped promo is shown. Naomi says Mandy Rose’s excuse was ridiculous. When they enter the Women’s Tag Team Championship Elimination Chamber, Fabulous Glow is going to come out. 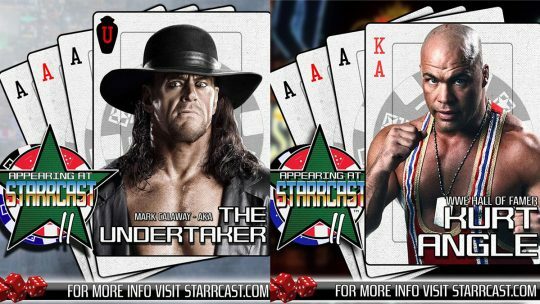 A triple threat tag team match is next. A pre-taped promo is shown of The IIconics talking about how hard they’ve worked to get to where they are right now. Backstage, Mandy Rose and Sonya Deville talk about their opponents. Rose says Naomi has not pinned her yet. Sonya Deville takes Carmella down and tags in Mandy Rose. Only two are allowed in the ring despite being a triple threat tag team match. Naomi tags in, so Rose runs over and tags in Peyton Royce. Naomi takes Royce down and points at Rose. We come back from the break to see Carmella apply a slow motion crucifix pin on Royce for a two count. Royce kicks her down and tags in Billie Kay. Carmella kicks Kay away, and Mandy Rose tags in. Rose stomps Carmella down and applies an abdominal stretch. Carmella gets out and tags in Naomi. Rose quickly tags Sonya Deville in. Naomi chases Rose before taking Deville out with some kicks. Deville tags Royce in. Naomi takes out Kay with a dropkick and sends Royce into Rose. Rose is technically tagged in. Naomi viciously pulls her into the ring and punches away at her. Royce comes in, and Naomi connects with Eat Defeat. Naomi comes back and hits Royce with the Rear View. Rose then hits The Bed of Roses for the win. Andrade is shown backstage. Andrade talks about the legend of Rey Mysterio. Zelina Vega comes up and says the legend of Rey Mysterio is a folktale. It’s a myth best left in books written about the past. What Andrade did last week was stamp out a legend not because he wanted to but because he needed to. You can’t fight fate. The legend of Andrade begins with Rey Mysterio’s end. 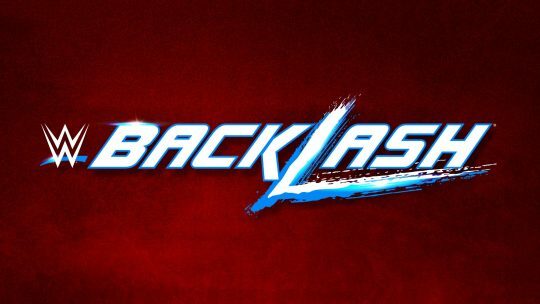 A video plays for WWE celebrating Black History Month. They showcase the letter Martin Luther King, Jr. wrote in a Birmingham Jail. Charles Robinson, my favorite referee of all time, is the official for this match. They circle the ring and lock up. Bryan applies a hammerlock, and Hardy goes to the ropes to get out. Bryan gives a clean break. They lock up again, and Hardy applies a side headlock. Bryan whips him off, but Hardy shoulder blocks him down. They hit the ropes, and Bryan turns him inside out with a knee to the midsection. Bryan uppercuts him to the corner and kicks away at him. Bryan backs up and charges, but Hardy takes him down with a modified clothesline before hitting a splash for a two count. Hardy sends him into the ropes for a back body drop. Hardy shoulders him in the corner before having a whip to the opposite corner reversed. Bryan then hits a pair of running dropkicks in the corner. Bryan then ties up the legs and locks him in a submission. Hardy gets out, so Bryan kicks him in the ribs a few times. Bryan sends him into the ropes, but Hardy holds on. Hardy dropkicks him out of the ring and hits him with a slingshot baseball slide. Hardy goes outside and goes to jump off the steps, but stops when he sees Rowan standing in the way. Bryan then sweeps the feet on the steps to take Hardy down. We come back from the break to see Hardy fight up from a hammerlock only for Bryan to take him down and stomp the arm. Bryan manipulates the arm and stomps it. Hardy eventually makes a come back, culminating in an inverted atomic drop and a double leg drop to the midsection for a two count. Rowan is shown watching on from ringside. They trade punches before Hardy tries for a Twist of Fate. Bryan gets out, and Hardy gives him a back body drop over the top rope. Hardy then dives off the apron with a clothesline. Hardy gets Bryan in the ring and goes to the top rope, but Bryan rolls away from the corner. Bryan catches him with a drop-toe-hold into the turnbuckle. Bryan kicks the rope into Hardy’s arm and picks up a two count. Bryan starts up the YES Kicks, but Hardy ducks the big kick and hits the Twist of Fate. Hardy hits the Swanton Bomb and rolls over Bryan to be closer to the ropes for his cover. Rowan predictably pulls him out and throws him into the steel steps. Samoa Joe sends Rowan into the ring post. Joe then pulls Bryan off Hardy and applies the Coquina Clutch. Randy Orton runs down, and he brawls with Joe. Mustafa Ali then runs down and takes them out with a double missile dropkick. Ali hits Joe with a suicide dive. Ali goes for a suicide dive on Rowan, but Rowan catches him and gives him an Iron Claw Chokeslam onto the commentary table. AJ Styles’ music hits, and he runs down to the ring. Styles gets out of an RKO and hits an overhead kick. Styles knees Joe in the face and hits Hardy with a Phenomenal Forearm. Styles points at Bryan, who is at the top of the ramp with Rowan. Daniel Bryan goes backstage and yells at Dasha Fuentes for trying to interview him. Bryan denies that Rowan helped him in this match. Rowan is his intellectual peer. Bryan says he did this all on his own because he is the WWE Champion. Bryan says all those guys interfered in his match. They aren’t going to get any of this at Elimination Chamber. The New Daniel Bryan will be the WWE Champion forever. That’s what the planet needs. Nobody understands it but him and Rowan.